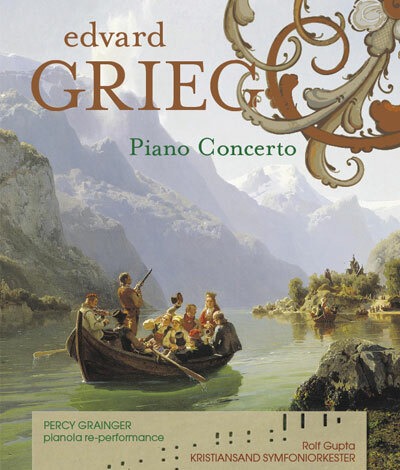 Nearly 90 years ago, in 1920, Percy Grainger recorded Edvard Grieg's Piano Concerto for the Aeolian Company's Duo-Art reproducing piano, an event of great historical importance, since Grieg regarded Grainger as his favourite pianist. When the young Grainger visited Grieg at the composer's home at Troldhaugen, Grieg was overcome with enthusiasm for the younger man's musicianship. "I had to become sixty-four years old to hear Norwegian piano music interpreted so understandingly and brilliantly. He breaks new ground for himself, for me, and for Norway. And then this enchanting, profound, serious, and childlike naturalness! What a joy to gain a young friend with such qualities!" Now, at last, Grainger's famous recording is available on high-resolution stereo CD and multi-channel Blu-Ray audio DVD, accompanied by the Kristiansand Symphony Orchestra, conducted by Rolf Gupta. This website describes the history of this unusual project and its musicians, and explains the techniques and instruments used on the recording. At the publication date, 17 August 2009, the remaining pages on this site are under construction, and they should be ready in detail by early September. In the meantime, for further information about the Pianola and Duo-Art, please visit the Pianola Institute, and for details of the new recording, the website of 2L.